I am pleased to report that I will be attending the upcoming Hadoop Summit 2015 in San Jose on June 9-11. I’ll be the guest of Hortonworks (host of the show and one of the leading Hadoop distributions) and will be covering the conference for insideBIGDATA. Check out insideBIGDATA’s new Hadoop 101 learning channel where I shall publish many of the new presentations I find at the Hadoop Summit. 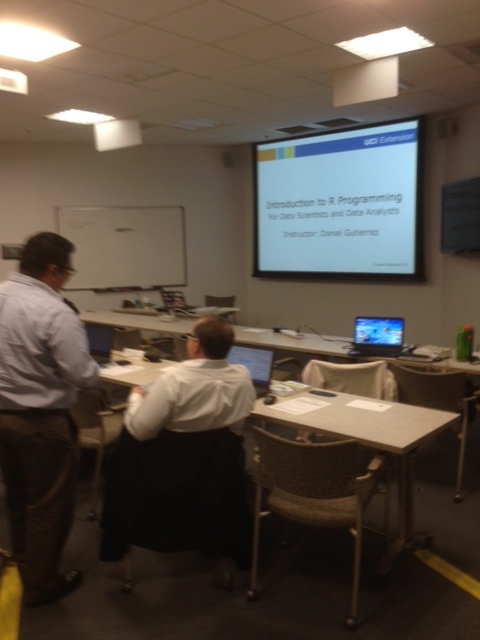 This week I started a boot camp style corporate training gig over at Southern California Edison in Irwindale. The title of the 7 week course is “Introduction to R Programming,” although I’m teaching it like an intro to data science class. The contract was arranged through UC Irvine as part of their popular data science certificate program. The SCE group attending the class is from a broad spectrum of SCE departments including IT, business intelligence, customer analytics, power supply, and business analysis. The participants see very capable and are anxious to move into the data science realm. I’m quite pleased to take some time off my busy project work schedule for a serious teaching assignment like this. Very rewarding!